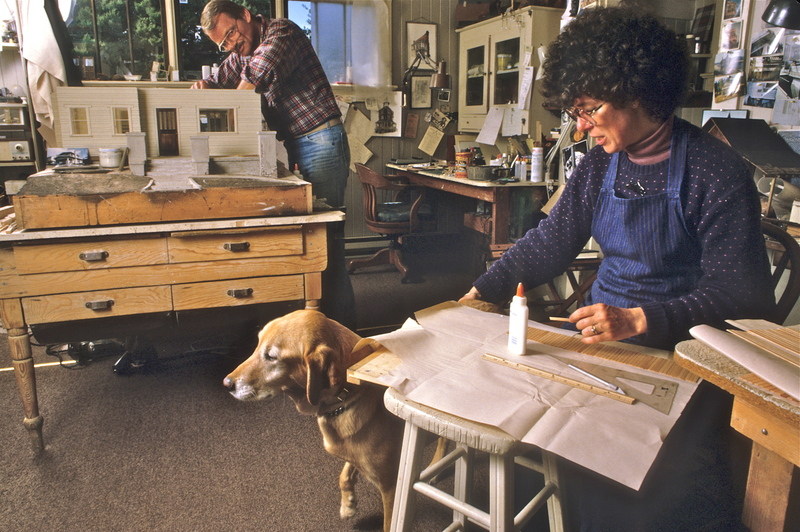 Starting with our 2ndmajor miniature show, Sarah Salisbury was an eager and repeat customer—she was open to suggestion, and introduced ideas of her own. Her enthusiasm for our houses had a lot to do with our ability to keep making them. Plus, on delivery, she always opened her house to us for a mini-vacation, which helped mitigate the long drives between So. California and Washington State. A lot of luck rode those miles with us and the un-tethered houses in the back of the van (aka the Black Ambulance, because one stormy night we delivered a friend in labor to the hospital in it). When we set out to deliver a house, it went in the back, surrounded by a few pillows, quilts and our clothes. And once our yellow Lab, Sunshine–invited to swim in Sarah’s pool. At the front end of the cargo area we set a cooler of home-fried chicken, peanuts, and dried banana chips—sustenance for the next 2 1/2 days. (One time it was cold poached salmon and gazpacho—left-overs from our traditional bon voyage potluck for friends who wanted to see our work). Great food, but not a barricade from a 50 lb. house should we have suddenly hit the brakes. These days I’d install a gate installed between us and the cargo area, and lash the house to the floor, but we were young, irresponsible, and fortunate. 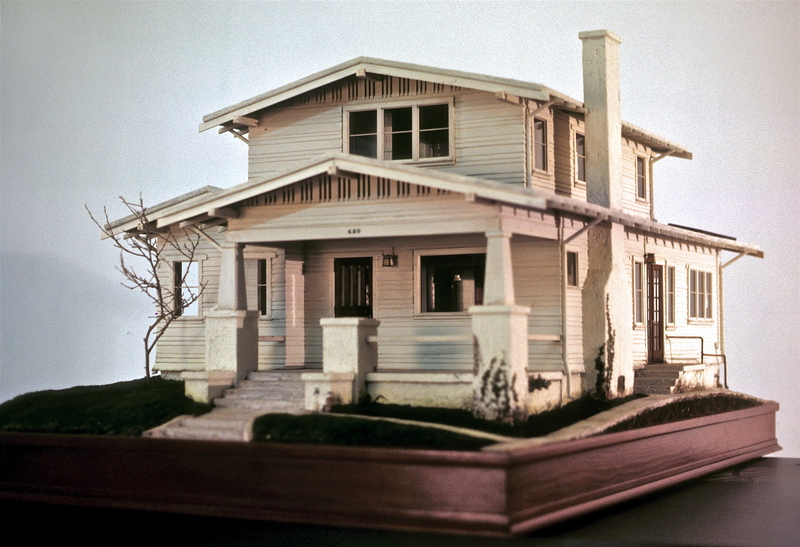 When Sarah proposed we make a model of her childhood home, an early 1900’s bungalow in Whittier, CA, we gulped. In dread. 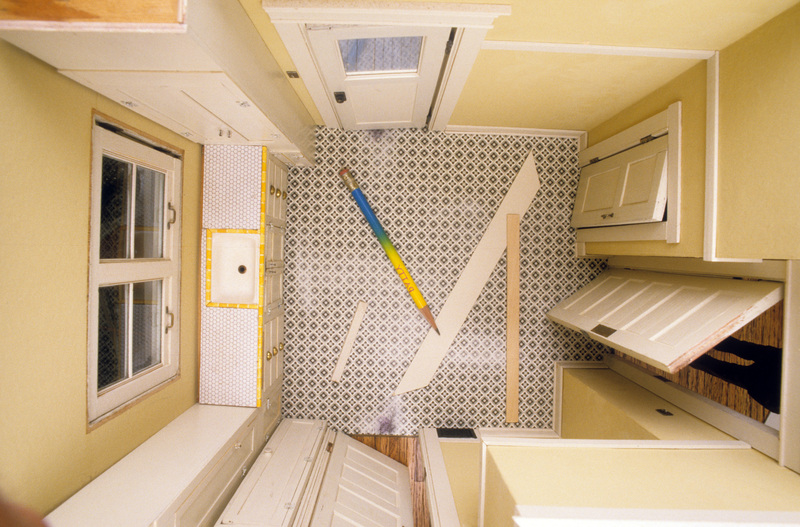 Years earlier Noel built a kit of a customer’s home, or tried to, from plans she sent. 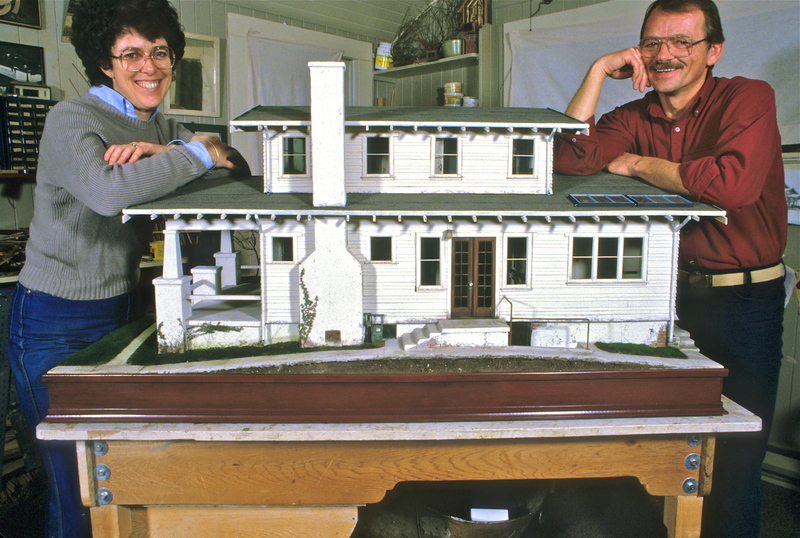 So many things were wrong with the plans he asked to see the house, but she refused, insisting her drawing was exactly what she wanted. 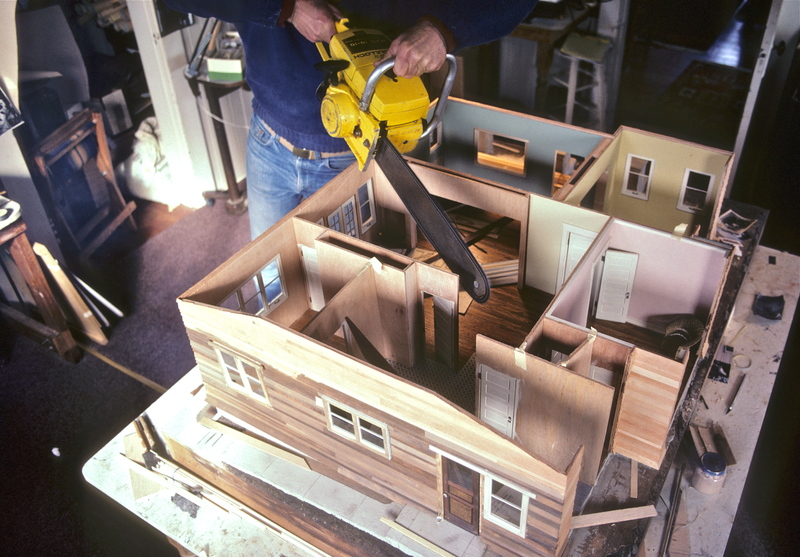 He struggled, called her many times about details, and built a pretty awful plywood house, according to the plans. Of course after one look at the finished piece she said, “That’s not my house–that’s terrible!” Later we turned away a commission for a childhood home because the customer was so lost in the romance of the house, we knew we could never have satisfied her. She wrote pages about the swing in the yard, the lilacs, and the five purple bathrooms, not to mention the elephantine structure which wouldn’t have fit on our studio table, much less have been deliverable. We could only build houses, not dreamy memories. So, there was Sarah, asking for the home she grew up in. We were intrigued because it was an “affordable” bungalow, built in the California Craftsman style, but with factory-built elements—a bungalow without the demanding Charles & Henry Greene peering over our shoulders. And it was Sarah, whom we knew to be a reasonable woman. If we were to take it on there would be caveats—it would not be a replica—better than a Cliff Notes, more a distilled version, filtered down to the essence of the style and spirit of her house. 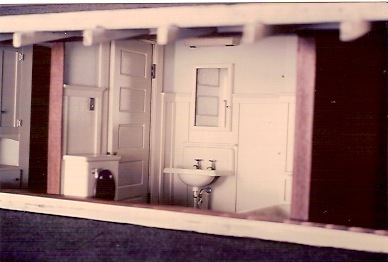 As with all our structures, it needed to fit on the work table, out the door, and into the van, so extraneous rooms had to go (miniature people only get one bathroom, or two, at the most), and placement of others had to be rearranged to fit the measurement constraints. In this case, Sarah had exterior photos of the house, plus she had drawn up fairly accurate plans for the interior layout. We had lots of scrap material on houses of the era, and could be guided by what Sarah remembered of interior details. Whittier kitchen–counter tile made from Thomas-embossed Joe Hermes paper. 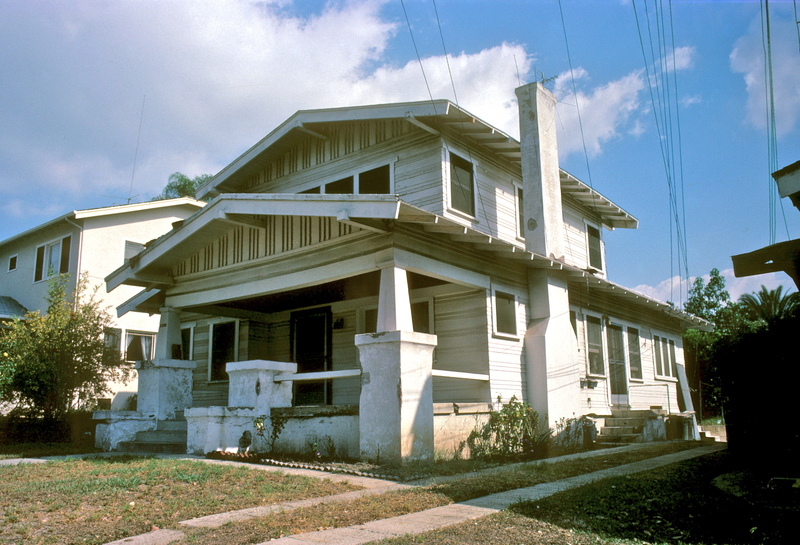 Whittier front and back parlors with built-ins, tile fireplace, and oak floors. Noel designed the lights that were custom built by Isabel Thompson. She remembered window seats in the dining room, lots of built-ins with glass doors, oak floors, and a kitchen with a basement door (with a lock, because little Sarah had been afraid of what might come up those steps). 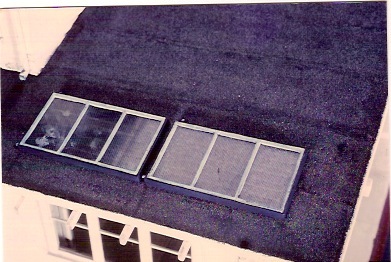 She also remembered it had back-up solar heating, with panels on the roof (yes, way back then, before the gas industry diverted our attention and $$$). She remembered enough details to make it fun for us all. We could build a house that looked like hers on the outside, and included the important rooms for making a convincing interior. We agreed to give it a try. Whittier studio shot–what remains of a lost batch of record shots by our friend Harry Liles. We spent nearly two years on the Whittier (named for its location), in and around preparing for classes and teaching, giving us plenty of time to check in with Sarah to make sure we were on the right track. 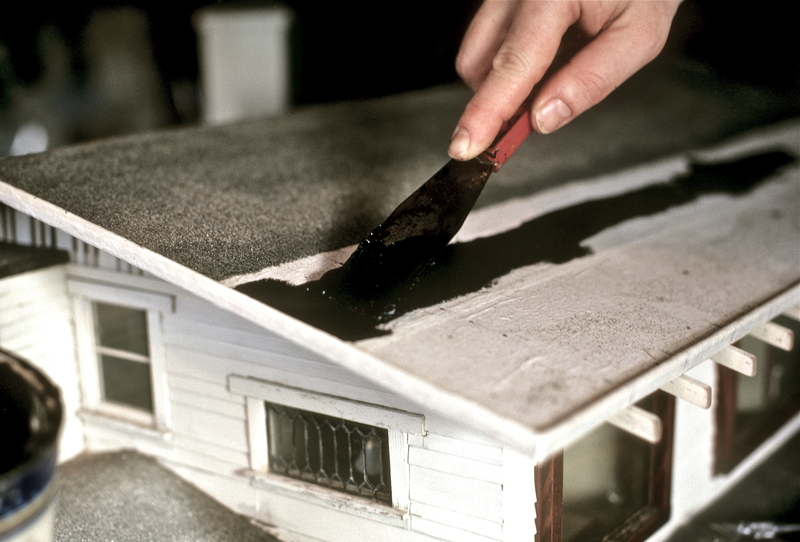 Applying roofing tar over strips of muslin before sprinkling on white bird gravel to simulate the reflective period roofing. Sunshine trying to pry us away from work and out onto the beach. 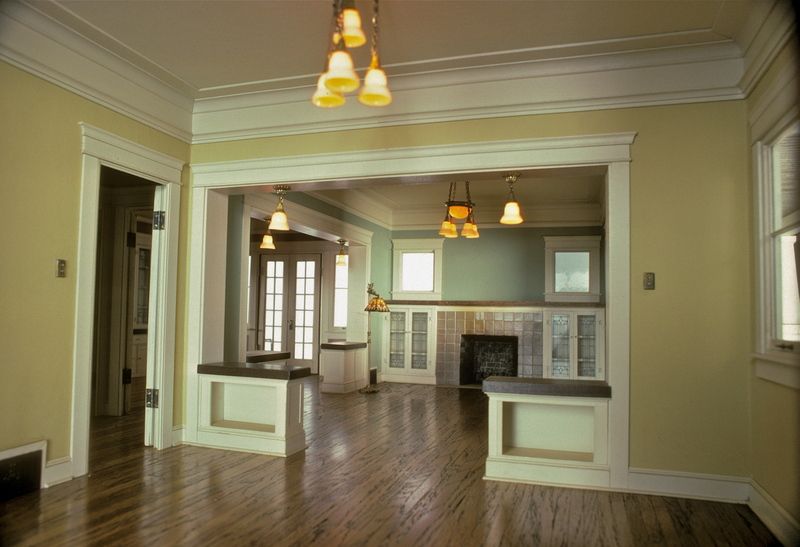 When we delivered it, a little nervously, she gasped a little gasp when she saw the dining room. Lifting the lid on the window seat she looked in–“ Oh! That’s where I stored my toys at dinner time, or when visitors came.” The padlock on the basement door made her laugh–we knew we had done it right, and that the rest of the house would fall in place for her. With the final payment tucked under our belts, and a lightened load in the back, we headed the trusty van home, splurging on restaurant meals and better motels. 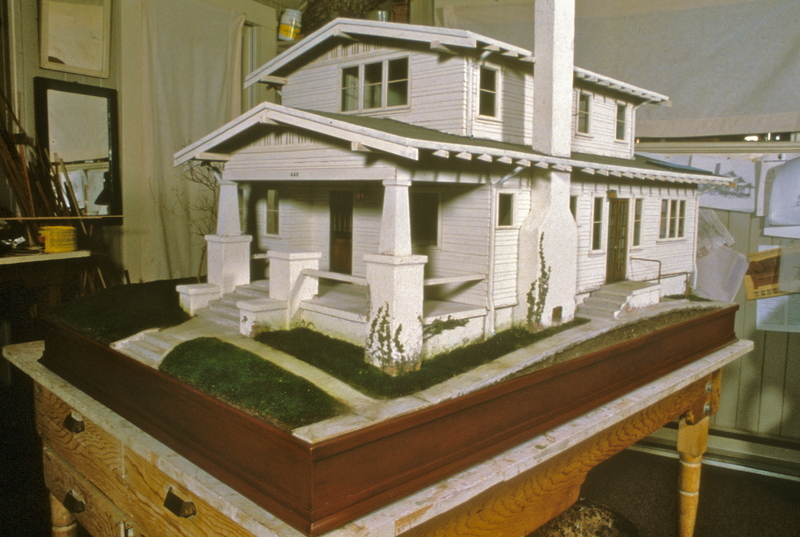 This entry was posted in Houses, Memoir, Miniatures and tagged architecture, bungalows, dollhouses, lifestyle, miniatures. Bookmark the permalink. Nice to hear she helped you out, too. She had a good eye, and was generous with her praise. I love reading about your work and life, Pat, keep on doing it…I wish one day, you will publish a book with all those beautiful texts and photos. I want the first one…I could even try to translate it into French for a world wide publication ! Leaving for Castine in three days, we will all miss you. Thanks, Catherine. Yes, a book would be fun, but I’m only half way through! Have fun in Castine, we’ll miss it. Give everyone our love, and have a lobster for us. I so enjoyed your Whittier story as I spent my teen years in a house around the corner from Sarah’s house and passed it every day going to high school. I saw your version about 10 or 20 years ago while visiting Sarah in Corona Del Mar and loved seeing it. Your version really took me back in time – it is a remarkable piece. I wonder where it is now that Sarah has died? Love your smallpress stories and really look forward to them. Will you be doing one on the “fruit stand” project we did on the Hawaiian cruise oh so many years ago? Please keep the stories coming! Thank you. How funny you were part of that cruise class–so many people either got sick or went on tour that we hardly had a class. Yes, it’s coming up in chronological order, though I don’t remember too much about it. Last we heard, Sarah’s daughter has the Whittier house, which pleases us.